Velocibox is an endless runner wherein you play as a box that zooms down a rectangular corridor. The goal is to collect several smaller cubes littered about to ascend to the next level, avoiding the myriad obstacles along the way. You move about the hall by sliding left or right and by flipping the room entirely. Sounds easy enough, yeah? Yeah. Except for the part where you’re moving at incredible speed and barely have time to react to anything. Swift reflexes are hardly a new requisite for endless runners, but Velocibox demands far more in that regard than its contemporaries. Where in most such games you can easily see what’s coming and react accordingly, you don’t get that same comfort here. Instead, everything comes flying toward you faster than you have time to process. It’s a game that demands you constantly be looking ahead and preparing for what’s about to throw at you next while still keeping your eyes on what lie immediately before you. A typical run in Velocibox only lasts a few seconds. Because by the time you try to slide or flip to safety, it’s often already too late. In the split-second you spent debating how to dodge those pillars ahead of you, the box crashed because you didn’t start moving to the left quickly enough. That split-second can also decide whether you successfully leap through a hole in the wall or collide with it. The margin for error is miniscule. You have to be able to identify the exact moment to slide or flip, because anything less always results in failure. Feels like a miracle when you manage to pull it off. Arduous, yes, but never frustrating. That’s in part due to how little down time there is between attempts – it’s literally a second – but mostly due to the game itself. 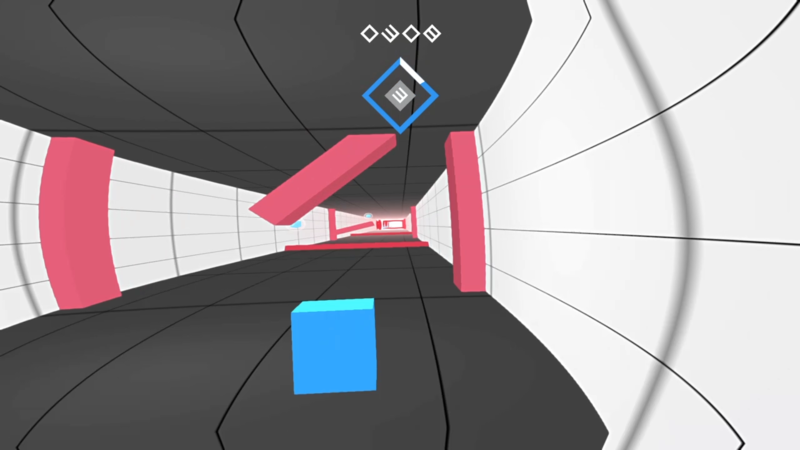 Where a lot of endless runners would force you to start from square one again upon failure, forcing you to replay the same portions of levels over and over, Velocibox keeps its levels quick and dynamic. The obstacles you face are generated on the fly, meaning you can’t rely solely on memorization. That sounds like a recipe for frustration, but it’s quite the opposite. By discarding static level design, Velocibox effectively trains you to adapt. Because you can never account for what’s coming, you learn to recognize individual obstacles instead of entire levels, meaning you can swiftly avoid whatever the game throws at you with greater ease. That might be an issue if each level were wholly unique in terms of hurdles, but they all play off the same toolset. The only thing that changes between levels is whether they’re stationary or not. Pillars move back and forth, rods twist in clockwise motions, and walls emerge without notice. They not be especially varied, but Velocibox gets a ton of mileage out of them. It’s not without its faults, of course. At times it felt like I ended up waiting for the right geometry to appear, enduring failure after failure in the hopes of getting that ideal run. On later levels especially, success seems predicated on luck; luck that you’ll get a series of obstacles that are easy to avoid and are plentiful with collectibles. The game clearly revolves around actual skill – all the luck in the world won’t do you much good if you can’t weave through the obstructions thrown at you – though it’s hard to escape the sense that luck plays a noticeable role. But even in constant failure, even if it is all luck, I always felt like I was getting better, getting closer to victory. Obstacles that previously destroyed me were now reliably navigable. What continued to do me in wasn’t so much barriers as it was my own hubris in trying to grab cubes that I never stood a chance of getting, taking unnecessary risks where I should have played it safe. Velocibox demands discipline. Out of the 1,014 sessions I’ve played, only a dozen of them were successful. Even with a firm grasp on how to play well, it still manages to best me. It’s a tough, but ultimately satisfying challenge, one that never manages to frustrate even in the face of constant, unrelenting failure. Striking that balance is no easy feat, but Velocibox does so splendidly.